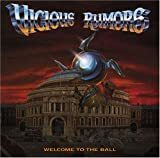 VICIOUS RUMORS PURITAN DEMONS LYRICS"
Oh you puritan demons hide in your closets of stone. Are you so pure when the walls crash in and you're overexposed? Gather round now all demons, taste of blood on your lips. One of your own has come crawling home and will you be there - No! Come now hell fire demons, feast as you follow your course. Circle your prey at the end of the day, cover your tracks at all cost. Smell you from here and it stinks to high Hell! Puritan demons display, like vultures they wait for death's leftovers. Bridges are burned everyday, lessons are learned and taught again. Look at all of those demons drown in a pool of deceit. Cut off your hands in spite of your face. I pity for you as you weep the year of the dragon. The metal dragon's a fire fierce and intense. I'll take nothing less, I don't have time for these liars. On we go day after day, worlds collide and machines take over. Puritan demons display, like vultures they wait for Geoff's leftovers. Bridges are burned every day, lessons are learned and taught again. The cycle continues to turn, like a vulture I'll wait. It's your time to burn! All Vicious Rumors - Puritan Demons lyrics are property and © copyright of their respective owners. All Puritan Demons lyrics provided for educational purposes only.